Hydrogen’s momentum is building, as European ministers consider approving a new ‘Hydrogen Initiative’ this week that aims to “maximise the great potential of sustainable hydrogen technology.” With funding from the EU’s Fuel Cells and Hydrogen Joint Undertaking, a consortium of industrial heavyweights in the H2FUTURE project is already ramping up production of hydrogen from renewable sources. But, as the International Renewable Energy Agency notes in a new report, for hydrogen to really take off would require broad political support. At the event, organised under the auspices of the Austrian presidency of the EU Council, they will be encouraged to sign a ‘Hydrogen Initiative’, a non-binding political declaration of support for hydrogen development. As reported on 11 September in Energy Post Weekly, a slew of recent reports and initiatives are now promoting hydrogen’s potential role in the energy transition. The focus is on power-to-hydrogen, or ‘green’ hydrogen, produced using electricity generated from renewable sources to power electrolysers that split water into hydrogen and oxygen. Published on 6 September, the International Renewable Energy Agency (IRENA)’s technology outlook ‘Hydrogen from renewable power’ cites the potential for green hydrogen to be used as energy storage for surplus renewable electricity, as an energy carrier and in sectors otherwise difficult to decarbonise through electrification. At present, one-third of global energy-related emissions come from sectors, mostly energy-intensive industry and freight transport, for which there is no economically viable alternative to fossil fuels. Over 95% of current hydrogen production is fossil-fuel based: most commonly steam-methane reforming (SMR), followed by oil and coal gasification. The hydrogen feedstock market is well established, with a value estimated at USD$115 billion. The lion’s share of the demand for this comes from the chemicals industry, for producing ammonia for example, and in refining for hydrocracking and the desulphurisation of fuels. Other sectors also use hydrogen, such as iron and steel, glass and electronics, but their combined share of total global demand is small. Although the green hydrogen production process is emissions-free, its expense has been a limiting factor in its wider use. However, the rapid expansion of low-cost renewable energy may bring costs much closer to that of SMR. Over the past ten years, EU funding of more than €100 million has been channelled, via the public-private partnership Fuel Cells and Hydrogen Joint Undertaking (FCH JU), to 30 projects using hydrogen in the ‘greening’ of energy-intensive industry. Its flagship project is H2FUTURE, an experimental hydrogen production facility currently under construction in Linz on the premises of Voestalpine. The steelmaker is a project partner in the H2FUTURE consortium that also includes Verbund, Austria’s biggest utility and one of the largest hydropower producers in Europe. The consortium has received funding of €12 million from the FCH JU and an additional €6 million from the project partners. “The IRENA report is really significant for us. 96% of our output is generated from renewables, mainly hydropower but also wind. Over the last few years, we’ve increasingly looked into investing in hydrogen as a green energy carrier,” says Walburga Hemetsberger, Verbund’s representative in Brussels, in an interview with Energy Post. Verbund is coordinating the H2FUTURE demonstration project and will provide renewable energy to power it. “From the utility perspective, the long-term benefit we see is the new degree of freedom hydrogen gives for storing and shifting large amounts of energy between seasons, although, of course, we regard it as very important to find solutions for energy-intensive industries that are difficult to decarbonise, such as steel,” says Hemetsberger. The H2FUTURE project is also a demonstration of sector coupling, a new buzzword in sustainable energy, meaning closer integration of energy-consuming sectors – buildings (heating and cooling), transport and industry – with power generation. “There are long-term strategic interests for each sector – energy suppliers, the steel industry, technology providers and research – represented by the partners in this project,” says Hemetsberger. “It’s only through coordination at the European level and the type of public-private cooperation enabled by the FCH JU that projects on this scale can happen. Working in isolation is not an option,” she adds. 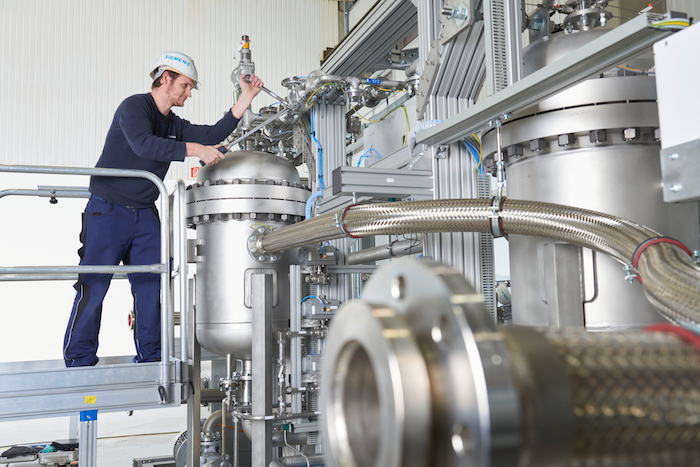 Siemens is supplying the proton exchange membrane (PEM) electrolyser for the plant, a rapidly emerging technology for water electrolysis in which Europe has a leading position that has been assisted by funding from FCH JU. It can operate more flexibly and reactively than current alkaline electrolysers technology – a “significant advantage in allowing flexible operation to capture revenues from multiple electricity markets,” according to the IRENA report. Alkaline electrolysers have been used by industry for nearly a century, but the rapid recent increase in power of PEM electrolysers (for example, from 100kW in a 2011 FCH-funded project Don Quichote, to 6MW in H2FUTURE) means that they are gaining market traction. The forecasts on how big a part green hydrogen will play in the overall future energy landscape vary considerably. 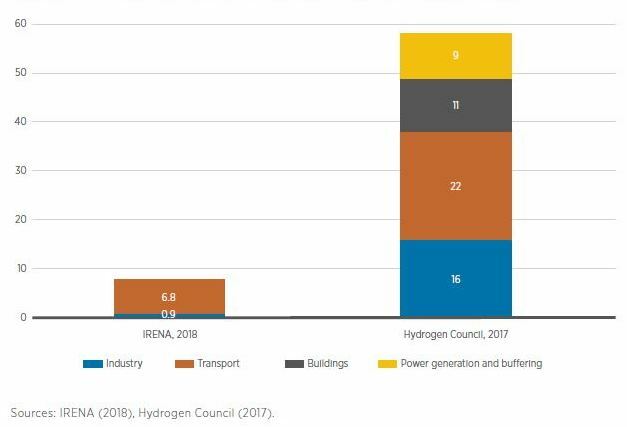 IRENA’s own economic assessment (using the Remap cost methodology) estimates hydrogen’s economic potential in addition to feedstock uses at about 8EJ at the global level by 2050 –around 2% of final energy consumption. Most of this would be utilised in transport, with significant use also in industry, mainly by the steel and chemicals sectors. A (much) more upbeat outlook for hydrogen is envisaged by the Hydrogen Council, a fuel cell and hydrogen industry coalition that includes major players such as Toyota, Total and Shell. It forecasts that by 2050, 18% of the world’s final energy demand could be met by hydrogen – equal to about 78EJ, of which 19EJ are feedstock uses. In contrast, a recent report, Energy Transition Outlook, from global technical consultancy DNV GL predicts that hydrogen will not constitute more than 0.5% of energy supply in 2050, although in some regions and some segments (for example, where there is a lot of gas infrastructure), the percentage will be much higher, according to the authors. The EU ministers did sign the Hydrogen Initiative document on 18 September, as reported by Reuters here. I hope that the current suggestions in Australia for intensified electrolytic hydrogen R&D, with the primary goal of exports to Japan and South Korea, will lead toward industrial and commercial developments. There are still cost barriers, and the Australia / J,SK combination is better placed than Europe to push on these. There seems to be an increasing realization that liquid and gas used for transport and storage will be an important part of the future energy economies; I would prefer to minimize the role of synthetic hydrocarbon fuels.